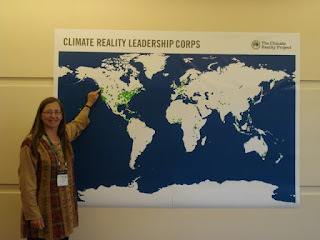 Well, my trip to San Francisco to train with Al Gore and the Climate Reality Project was invigorating and memorable! After a tiring but fascinating 22-hour train trip, it was inspiring to spend three days with 1000 other like-minded and like-hearted people ... from 57 or so different countries, no less! I'm now a trained presenter, and look forward to sharing the Climate Reality slide shows with people of all ages and in all walks of life throughout my small corner of the world. I had to laugh that even amongst allies, I still found myself holding a much more acute view of the global warming problem, the necessary solutions, and the power our fossil-fuelled industrial civilization (no, not the whole human species) holds to radically alter the biosphere, making it inhospitable to life, period (not just to human civilization). It's somewhat of a curse living with a full-time science advisor (aka my husband) who spends practically every waking moment reading and synthesizing the scientific research on global warming and climate change. I often rue knowing so much about what's really going on. 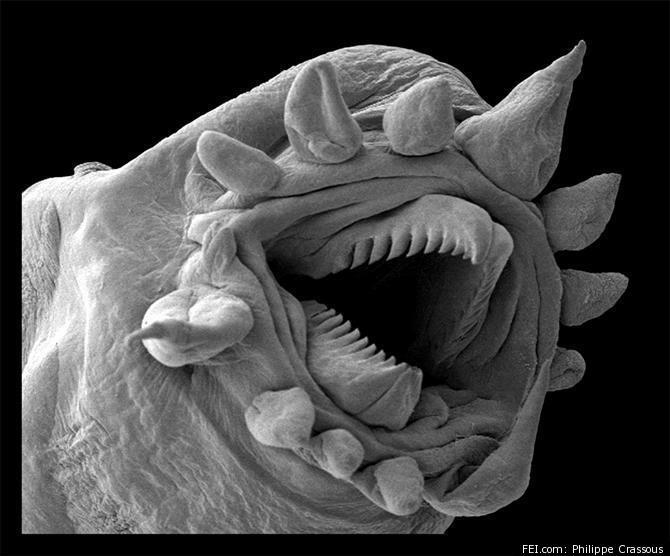 But a great gal (and a science teacher) sitting next to me restored my faith in a master evolutionary plan when she reminded me that the newly discovered creatures living around the thermal vents at the bottom of the oceans will survive just fine. After all, they didn't evolve in the narrow atmospheric temperature range that we're used to. So all hope is not lost. If we don't get our butts in gear and stop our carbon emissions while pulling CO2 out of the air, humans will disappear and millions of other species will disappear along with us. I'm not sure yet whether I'll tell the full truth about the reality of the climate change situation when I make my presentations. Mr. Gore has decided not to, choosing instead to talk about the end of human civilization. He probably knows his audiences well. Picturing the world without "me" in it is existentially difficult. Imagining a world completely devoid of the human species is nigh on impossible. I keep thinking that this desperate state of affairs will motivate the pants off people to do whatever it takes to cool the globe. My theory, ahem, doesn't seem to work in practice. I don't know what the philosophers have to say about my dilemma (full truth or only partial truth? ), but some psychologists believe that people (in our North American society, at least) simply cannot handle knowing the reality. 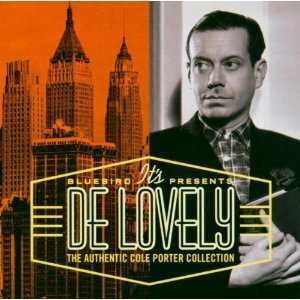 I watched De-Lovely recently, a movie about the life of Cole Porter. (No, I don't spend every waking moment contemplating the end of life on Earth.) I knew nothing about him except for some of his songs, so I did some research. (Yes, this is relevant to the question at hand ... wait for it.) It seems that some of his shows in the 1930s were failures. According to Wikipedia sources, this convinced Porter that his songs did not appeal to a broad enough audience. In an interview, he said, "Sophisticated allusions are good for about six weeks ... more fun, but only for myself and about eighteen other people, all of whom are first-nighters anyway. Polished, urbane and adult playwriting in the musical field is strictly a creative luxury." So you see, with both Al Gore and Cole Porter suggesting that people won't listen to what they don't want to hear, I'm still torn on whether to tell people about the impending consequences of Arctic summer sea ice collapse (2012 is the worst year ever) and the drought we're seeing all over the world (2012 appears to be the worst year yet for Northern Hemisphere drought). (See short videos below.) I welcome your frank (but not brutal) advice on which way I should go. Thanks! Arctic ice extent is critical to Earth's temperature. Less Arctic summer sea ice means more Northern Hemisphere heat and climate disruption. Can you say "bread basket"?